No other Snare drum has changed the face of marching competition like the FFX Championship Series. Used by today's top DCI corps, these drums have won more than their share of High Percussion Awards. The combination of 6 plies of 100% Maple free-floating in a super lightweight aircraft aluminum frame creates a force to be reckoned with. Designed to easily withstand today's super high tensioning. The Championship Maple Snare shell’s natural balance of mid to high frequencies brings the FFX the voice that set the industry standard and changed the face of corps competition. 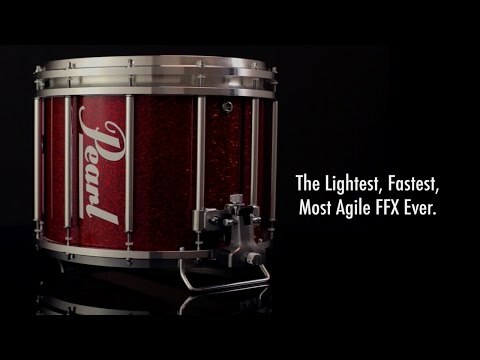 Pearl’s Superior Shell Technology is used to make a 6-ply, free floating shell out of maple, the drum industry’s premium for dynamic range, sensitivity, and unsurpassed projection. Because of the maple shell’s strength and reliability, your corps or band can compete in all climate conditions. The FFX Aluminum Frame supports an aluminum alloy edge ring, providing you with a top bearing edge that can take all of the pressure necessary for today’s high tension heads. 2-ply reinforcement rings and a 45 degree bottom bearing edge provide shell stability and shape integrity while focusing the drum’s maximum sensitivity and volume. Available in covered, FFXM, and lacquered, FFXML finishes. The CX AIRFRAME Carriers feature a solid rod, form-fitting upper shoulder frame attached to a thin aluminum belly plate with extreme range of motion. The ACS (Agility Control System) Belt unites the player to their instrument for optimal stability in today’s modern use of body movement. The shoulder and belly pads are removable for cleaning and are built with a “Stealth” design; the Carriers practically disappear under the uniform. The MSS3000 Marching Snare Stand has a height/range adjustable double-braced front leg and a stability arm for stable playing surface. Pearl Sound Projectors attach to the bottom of marching snare drums via hook and loop fastener to improve forward projection. The MSB-1 and MSB-2 stick holders securely attaches to any marching drum with hook and loop straps. MSB-2 stick holder, allows for holding two separated sets of implements.